When I first heard about the National Do-Not-Call Registry years ago, I immediately registered all my phone numbers, even my landline numbers at the office that I worked on. Anytime I have acquired a new number, such as when I moved or just changed phone numbers, I have likewise immediately registered the new numbers. But these registrations never did any good because telemarketers of all kinds just kept calling. Telemarketers seemed to become even more of a nuisance after I started carrying a cell phone. With landlines, I didn’t even hear a lot of the calls because I frequently wasn’t around the phone. But with the cell phone, almost every call can be a distraction unless you just turn it off and put it away. For many years I tolerated illegal robocalls calls with one of three different reactions: 1) by immediately hanging up the phone when I realized I had been duped into answering yet another telemarketing call OR 2) by politely advising the caller that my number was listed on the Do-Not-Call-Registry and I would like to not receive telemarketing calls OR 3) by demanding in no uncertain terms and with varying degrees of abuse that I not be called again. None of this ever, ever worked to stop telemarketing calls. Sometimes if I was polite to a telemarketer in the manner I requested to not receive any more telemarketing calls, they would at least say “I’m sorry”. Other times even if I was polite they would just hang up the phone on me in mid-sentence. I should answer my phone when it rings. But I have come to understand that the numbers of auto-dialed, machine or robot-calls I receive can make me a less productive person. When I am working I need to be focused on working, not distracted, interrupted and harassed by telemarketers. I began considering doing more about telemarketers than one of my 3 usual responses or just turning off the phone. I had heard of the Telephone Consumer Protection Act so I looked it up and actually read it. It sounded good – $500 to $1500 for each and every violation of the statute. But I continued to tolerate telemarketers and be frustrated because I was too busy with everything else. Then in 2016 there was the proverbial last straw that broke the camel’s back. Even though I was regularly being interrupted and distracted by anywhere from 2 to 6 or 7 or more telemarketing calls every day, at least they seemed to be from different callers so I never got too mad at any one particular caller. But one week I began receiving auto-dialer calls from a particularly abusive telemarketer, calling me 2 to 5 times every day with the same number always appearing on my Caller ID. So I knew it was the same caller. One day I answered a call from this dialer and politely advised the telemarketer that my number was on the Do-Not-Call Registry and I would like to NOT be called again. This telemarketer hung up the phone so rudely it literally sounded like she would break the phone from slamming it down so hard. The calls from this same number continued unabated. A few days later I answered another call from this dialer and this time I abusively told the caller to NOT call again. Again the caller hung up the phone with a slam before I could finish what I was saying. The calls from this same number continued unabated. So that was it. I decided I was going to identify this caller and sue. I answered another call from this dialer and this time I patiently listened to the telemarketer’s stupid little sales script. I sounded interested enough in the sales pitch, and I didn’t say the wrong things that would make the telemarketer hang up on me. That soon enough got me transferred to another telemarketer who was going to try to “close a sale” with me he thought. I continued to patiently listen to the ridiculous little telephone sales script, and soon this telemarketer trusted me enough that I was able to talk him into sending me an email or something so I could identify the actual business that was actually responsible for subjecting me to these illegal calls. I think I said some things like “Surely you can understand how I would want to know for sure who I might be doing business with. What is your website? Send me an email or something so we can talk more.” And they did. I was directed to a website and sent an email with an “application” to fill out and return for the ridiculous, worthless service I was being offered. Well then I knew who was responsible for the call and soon I knew where they were too. So guess what I did next? I promptly wrote up a Telephone Consumer Protection Act lawsuit, filed it and sent it across the country to be delivered to these people. It took another week before this caller received my lawsuit, and I continued to be harassed daily by this caller until then. So by the time this caller received my lawsuit this caller had illegally auto-dialed me dozens of times. But you know what? Shortly after receiving my lawsuit this caller’s auto-dialer calls actually stopped. It was like a minor miracle. Then they started calling me from a different number but they were no longer illegal robo-calls – their next calls were actually human-made and they knew my real name and they didn’t want to hang up on me no matter what I said. And also this time they no longer insisted that I listen to some stupid little scripted sales pitch. Now when they called there was a person on the other end of the phone who wanted to say “I’m sorry”, and because he had been sued he was in fact genuinely sorry. But you know what else? “I’m sorry” was no longer good enough for me. I made this company PAY. They seemed to understand that a lot better than the federal government’s National Do-Not-Call Registry and they have never called me again. I made these people send me over $10,000. After tolerating illegal telephone harassment for many years and it making me a less productive person, “I’m sorry” is no longer good enough. But in the end I can report some good news: Since I started suing telemarketers for illegally harassing me while I’m trying to work, since robo-callers I catch now have to PAY ME MONEY in addition to saying “I’m sorry”, I now seem to get less illegal telemarketing calls disrupting my days and aggravating me! 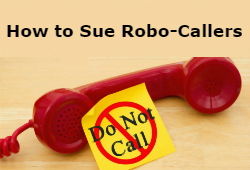 I’ve learned there is “a real do not call list” the telemarketing industry passes around to itself – the lists of people who have actually sued telemarketers for illegal robo-calls. This list the smarter ones actually take seriously! So I now get LESS telemarketing calls because I stopped tolerating them.